What’s It About: Can I say? Is it allowed? Why: I love doubling about as much as I love unreliable narrators, and there’s lots of that in here. Thoughts: Lots. I can imagine the sort of powerful impression a book like this would have on a young man, fresh out of college, and already disillusioned with the way the world works. Because at its heart, that’s what the novel is about– the renaissance of the “angry young men” and this time, they’ve got homemade explosives and a successful soap business. There are all sorts of world problems listed here, but first and foremost are the economic ones. My personal favorite scenes are all the ways Tyler and Mr. Narrator screw with the rich and famous. There’s plenty of discussion as well about commodities and advertising, about the individual losing his sense of self among the faux cosmopolitanism and consumerism of ‘nauseating’ 90s (I stole that nauseating 90s line from somewhere else, can’t remember). I’m also fresh off a class reading called “The Metropolis and the Mental Life” by George Simmel. Simmel basically argues (and I’m being reductive here) that the city life bombards residents with so much stimuli that we effectively close ourselves off from healthy emotional lives because otherwise, if we actually took time to process all these stimuli, we’d go crazy. In closing ourselves we also neglect to see the true value of people and of our own individuality.Throw in industrialization, consumerism, division of labor, and several other city influences, and you’ve got yourself one heck of a sad life. I feel that the members of Fight Club combat this feeling of loss by opening themselves and others to vulnerability. Much like the support groups that Marla and Mr. Narrator attend, Fight Club allows for people to expose themselves completely and sacrifice one another in the hope of symbolically fighting their external problems. What is Tyler’s Project Mayhem all about? Making ordinary citizens feel vulnerable to extreme violence and instability, thus disrupting the twentieth century enclosure that secures and dissolves them. It’s this opening up that joins people together. When we truly realize how completely dependent we are on each other, whether it’s keeping each other’s identities secret (don’t talk about fight club) or the knowledge that someone might have poured gasoline in your light bulb while you were out of the office, we can actually see the reality of our relationships and individualities. Of course, I’m not condoning this plan, but it’s really quite complex and goes further than simple acts of domestic terrorism. 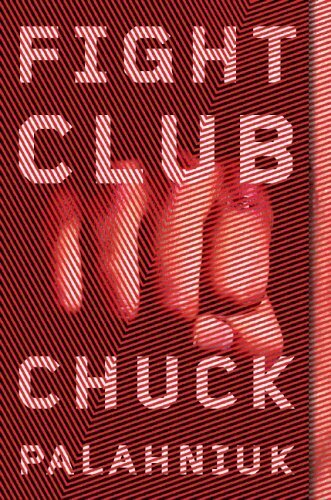 In his afterword, Palahnuik emphasizes that the fighting itself was not his drive for writing the book (he says he could have made it “Barn-Raising Club” for all he cares) but rather depicting a male social interaction. He also mentions that he wrote the book as rather loosely fitting anecdotes coming together, all united by the now infamous rules of that provide continuity to the piece. Awesome. Palahniuk’s prose style is unique. I often had trouble focusing, especially scenes where the descriptions vascillate between two different scenes, but I appreciated it for its nuance and attitude. I found it exhausting to read, though, and maybe fighting through some of his scenes feels a lot like getting punched in the face. Two questions I need answered: Why soap? and why the hole in the cheek? that was just gross.